Qatar kicks off the 2019 MotoGP season this weekend and the battle to be world champion will be closer than ever before, according to Neil Hodgson. Between them, Marc Marquez and Jorge Lorenzo have won the last seven titles in motorcycle racing's top tier, with the former eyeing a fourth successive crown in 2019. He may struggle to achieve that with the package he has available to him – according to Hodgson – meaning the race is wide open as week one gets under way. Here we take a look at the top contenders for the riders' championship and get Hodgson's thoughts on their title chances. "Going into the start of the season, the Honda is not the strongest bike and Marc Marquez isn't 100 per cent fit. The last six years I've said, when asked, Marquez [will win the title] but this is the first year I'm going to say I'm not putting him as favourite going into the season, which is exciting." "He's the wily old fox, very experienced. He doesn't risk anything in testing, what he does is uses testing for testing, he develops a motorcycle and makes sure the bike is as good as it possibly can be. Dovi's had a great winter, he's worked on his race pace, not his single-lap set-up, so Dovi is my man." "No [title chance], and I’ll be hated for saying that. Rossi, I think, will win a race or maybe a couple of races, I just don't think the Yamaha is quite strong enough to take him to be a world champion. He's quick enough, obviously, and if the packaging underneath him was slightly better I'd say yes [he can be champion]. I just don't think Yamaha is the strongest bike for a full season. It'll have its days, but at some of the tracks it'll be the third-best bike." "Similar issue [to Rossi], he will win races this year but I can't see him having the package he needs to take him to the title." "I think he'll go really well [at Honda]. Unfortunately for him he's had such a bad run of injuries, more than anyone. He's had broken hands, feet, wrists all in the last six months. So he's had a terrible pre-season, that said when he has ridden the motorcycle – albeit not 100 per cent fit – he's gone better than a lot of people expected. "I don't see him winning a race this year. I can see him regularly on the podium, I can see him having fantastic results, but I can't see him beating his team-mate Marquez. I always put my money on Marquez, only because that bike has been built around him. But I hope he'll be impressive." "Rins finished the season incredibly strong on the podium two or three times in the last four or five races, he's been top two in pretty much every pre-season test on race pace. I think he's matured nicely and the Suzuki looks like it's improved some of its weaker points." 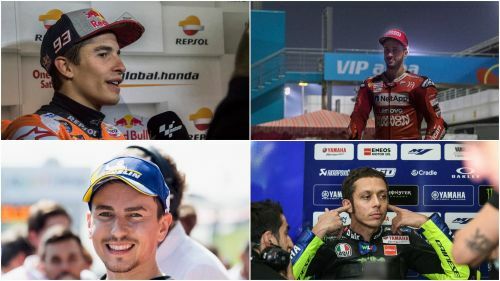 And if you fancy a surprise package in 2019, Hodgson believes there are three rookies worth keeping an eye on - Francesco Bagnaia (Alma Pramac Racing), Fabio Quartararo (Petronas Yamaha) and Joan Mir (Suzuki). Hodgson added: "Francesco Bagnaia's the Moto2 world champion, a young Italian, very impressive. "And then you've got the young French rider Fabio Quartararo. He finished second at the last test. A lot has been said about him the past, he was the youngest junior world champion at 13, then he won it the year afterwards at 14, incredible rider. "And then you've got ex-Moto3 world champion Joan Mir on the Suzuki, he's another incredibly talented young kid. "All three of them are clever lads, they'll work it out and surprise a lot of people."